All armed hostage-takers have surrendered after two weeks of standoff in Armenia's capital Yerevan as they barricaded themselves inside a police compound. One more gunman was wounded by security forces on Sunday, who had given the attackers until 5pm local time on Saturday to surrender. "The security forces' anti-terrorist operation has ended and led to the members of the armed group laying down their weapons and surrendering to the authorities," the national security services said in a statement. The gunmen had held four police officers hostage for a week before releasing them unharmed. They later seized four members of an ambulance crew, but the last two were allowed to leave on Saturday. The gunmen killed one officer and wounded several others in their initial attack. Police accused the opposition gunmen of killing a second officer on Saturday as he sat in a vehicle away from the compound, but this was denied on Sunday by a leading member of the armed group inside. The standoff started on July 17 when 31 gunmen seized the police compound demanding freedom for the leader of the opposition group who was arrested in June. The opposition group has sharply criticised the government of the former Soviet republic and called for people to take to the streets to force the president and the prime minister to step down. Several thousand people have joined nightly rallies to support the gunmen, occasionally clashing with police. 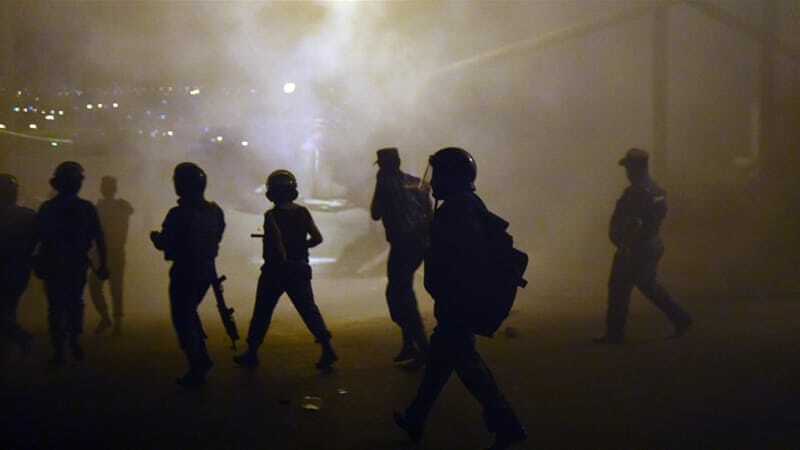 On Saturday night, the demonstrators marched down Baghramyan Avenue toward the main government buildings and the presidential residence, but were stopped by riot police, who strung coils of barbed wire across the road. The demonstrators blocked traffic for about two hours, but dispersed peacefully early on Sunday.